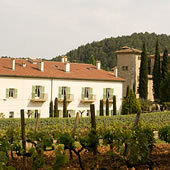 Set in the middle of 1,500 acres of luxuriant vineyards with its own winery, the Chateau de Berne (Relais et Chateaux) offers the luxury of peace and quiet in the Provencal countryside up in the hills away from the coast and its hoards yet close enough to everything to make a complete holiday. It's wines are superb, its restaurants delicious and service with a smile. Comfortable rooms, plenty of sportive opportunities, cooking classes, bikes for exploring. A great place for a vacation, wedding or honeymoon or just as a week end get-away. This is a great place to get away from that "maddening crowd" and de-stress, unless, of course, you love the maddening crowd. Here you will find the pastoral peace and quiet of the Provencal countryside. 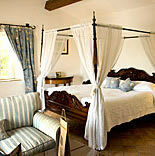 Sleep in a delightful room with blue shutters on the outside and a fireplace facing the bed on the inside. The view out your window is the quilt of the forest, vines, courtyards or gardens with their water works. Maximum relaxation guaranteed between games of tennis umpired by the olive trees, all-terrain vehicle excursions, cooking classes and meals on the terrace beneath the pergola interspersed with visits to the winery at the bottom of the drive with a marvelous selection of wines all in the distinctive square bottles particular to Chateau de Berne. Here you can be as active or slothful as fancy dictates - or both. With so much countryside surrounding the chateau, the hotel mountain bikes let you cover the rough terrain or ride the smooth private lane that leads to town. Tennis, hiking, swimming (or sunbathing on the surrounding teak deck) overlooking the vineyards below. The Spa can sooth out physical and emotional kinks. The cuisine, matched with estate wines, can sooth the soul. The coast is not far away, and yet, far away enough to avoid the crowds of summer. The winery is more than just a tasting room. It is also a lovely boutique with all sorts of things culinary from joyful plates and cutlery for your dining room to furnishings and furniture and everything between. There is a club room with overstuffed sofas and blazing fire place. To be sure, the tasting bar is extensive and excellent with views out over the cave with its fermentation tanks in the background and its rows of barrels in the foreground. The rooms in the specially built, modern annex are charming, decorated with antiques and muted, distinctive fabrics. They are serene with peaceful views that catch the early morning sun. Each one is individually designed and furnished and range from their spacious two room suite (that was home to Brad and Jolie on their honeymoon) to more basic rooms but all spacious with that country house feeling that makes you feel you are visiting with friends in their Provencal home rather than a hotel. While the bathroom in our room was a touch cramped with no soap in the shower and with worn hardware in the bath/shower and no room at all for a sponge bag or razor, most seemed more accommodating to their guests. We also applaud the eco-friendly environment they provide. Since we did this coverage a few years ago, Chateau de Berne has introducted a new young chef straight from Michelin starred kitchens of Paris - Chef Jérémy Czaplicki. While his style will be different, the ambiance will be the same. This was our experience: The service was friendly but always professional. The wines from their own vineyards were a treat. And the experience of eating in "L'Orangerie", the flag ship of the hotel serving dinner in this lovely new Victorian styled solarium that lets in the sun on fine days and protects you from the wind and rain on less than perfect days but always provides a lovely view of falling twilight as you enjoy the meal is magical. The former chef was good but his recipes were not a success. So we are hoping that chef Jérémy Czaplick will have brought a steadier hand to the cuisine of this lovely establishment. The lunch at their informal bistro (below) was more of a success. The less formal "La Bouscarelle" restaurant across the walk-way is located in the former winery building that serves outside on the restaurant's terrace or inside in a couple marvelously individual dining rooms. We started lunch outside in the sunshine but darkening skies and a sudden wind whipped rain drove us inside to the cozy dining room. The meats and fish are cooked under the overhanging roof on a wood fire place (probably old vines finding a second life). Whether you are in the mood for a Salade Nicoise or a more robust lunch, this is a great place to come even if you are not staying at the hotel. In fact, it is about the only good restaurant in the area, so it enjoys a considerable local clientele. 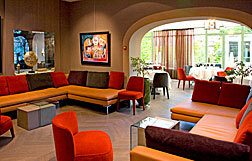 Visitors come even further to enjoy the cuisine at "L'Orangerie" in the evenings. The sommellier is very knowledgable about both the wines of the Chateau as well as which wines will complement the different dishes on the menu. We put ourselves in his hands and were mostly delighted with the results. This is a small, intimate hotel, that will be a perfect location to either sit back and enjoy a vacation or provide a great base from which to be as active as you want with beaches in one direction, mountains and the Gorges de Verdon (the French Grand Canyon) in the other and right at your feet a vibrant winery with tours, tastings and wine lessons. Nearby there is golf, equestrian, formula 1 track and many more activities. There are cultural and music events at the winery's outdoor arena that doubles as a helipad during the day And you need never leave to eat unless you want too. The Spa provides hours of relaxation and beauty restoratives and you can bone up on your cooking skills at the cooking school. The Chateau offers many different packages to choose from as well as a la carte stays. You really can't go wrong.